David Bowie's infatuation with Japan is no secret. It began with a keen interest in the extreme make-up of Kabuki theater and continued with an interest in musician Tomoyasu Hotei and filmmaker Nagisa Oshima. And fashion followers will know about his work with fashion designer Kansai Yamamoto. Now a project returns the love by immortalizing Bowie in the form of ukiyo-e, or traditional Japanese woodblock prints. Two unique prints were announced last month from ukiyo-e Project, an organization that creates contemporary ukiyo-e based on elements of pop culture. Each of the prints is inspired by iconic photo shoots of Bowie, translated to print by ukiyo-e artist Masumi Ishikawa. One of these takes its cues from Brian Duffy’s iconic 1973 photograph of Bowie with a red lightning bolt painted across his face for the cover of Aladdin Sane. 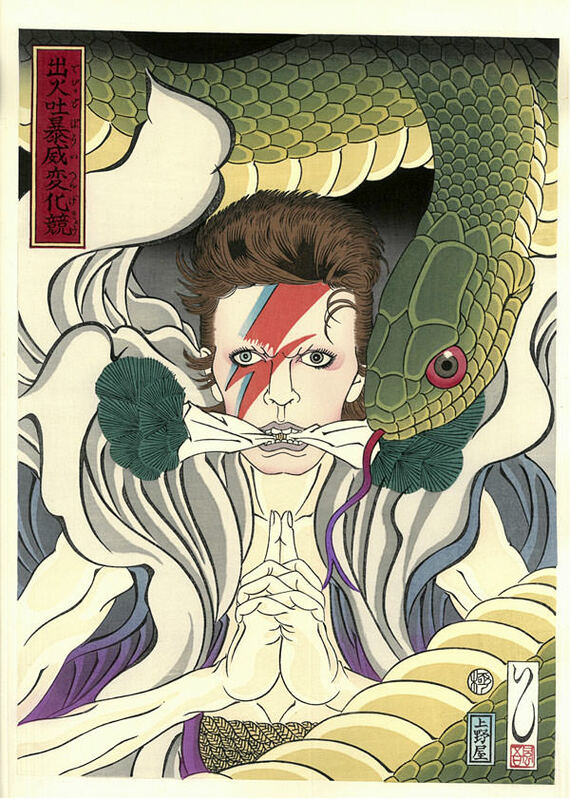 For the ukiyo-e print, Masumi Ishikawa imagines Bowie as Kidomaru, a fictitious snake charmer from the Kamakura period. The second print was inspired by Terry O’Neill’s 1974 Diamond Dogs photograph, in which Bowie poses with a barking dog. 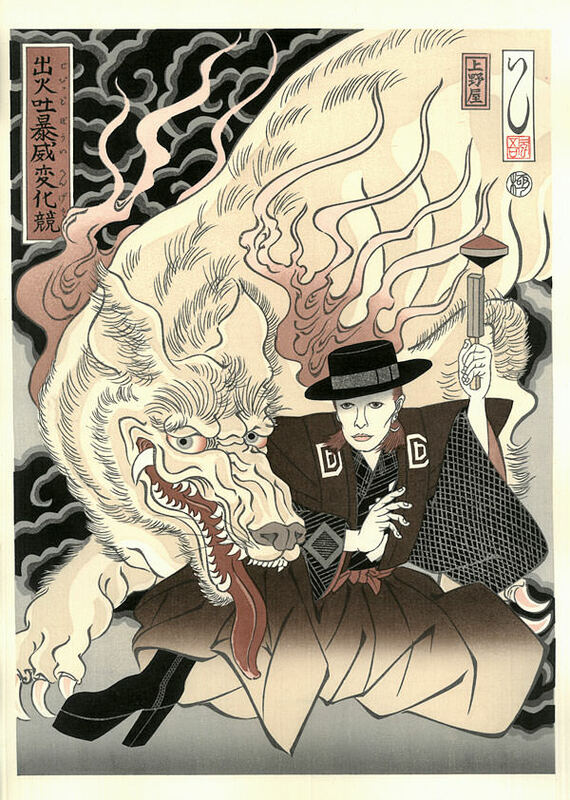 For this ukiyo-e print, the artist imagines Bowie as the magician Takezawa Toji.